When the guy behind the gun bar handed me the Taurus PT92, I knew I was holding a quality piece of equipment. The gun is big. No other word for it. And heavy (actually that is one more word). But big and heavy make for a soft shooting, accurate and dependable 9mm duty or military style pistol. Mine, which eventually became my daughter’s, and eventually became somebody else's we sold it to, had over 1000 rounds through it with no failures. 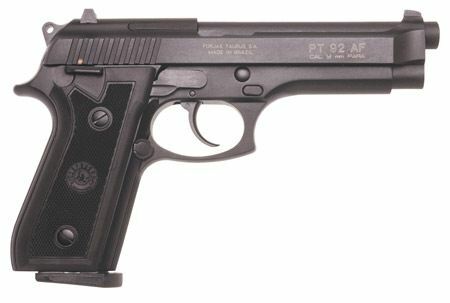 The PT92 design included some minor improvements over the Beretta 92, though the guns look identical and virtually all significant parts are interchangeable. This was the first quality pistol produced by Taurus after purchasing the Brazilian Beretta factory with all designs and tooling. It remains one of their most popular pistols today. The Beretta version of the 92 has been used for years as a military pistol for good reason. Durability, dependability and accuracy. The Taurus PT92, like the Beretta has a unique “exposed barrel” slide that works for some reason. Maybe there is some other design like this one, but I don’t know of it if it exists. The front sight on the PT92 is forged into the slide, and on my model, the rear sight was a fixed notched blade, dovetailed into the slide, though there are variations in different models. It has a traditional exposed hammer and firing pin and sports a frame mounted safety and de-cocker that allows for safe carry with a double action first shot and single action thereafter. The Taurus PT92 double/single action pistol was a pleasure to shoot and I typically would put 250 – 300 rounds through it in a session. The gun came with two 17-round magazines for plenty of firepower. My PT92 came in a Taurus black cardboard logo box with no frills. But that’s ok. Because this gun retailed for $389 at Academy Sports compared to over $500 for the Beretta. There is absolutely no reason to pay that extra money for the Beretta. The Taurus is every bit the gun the Beretta is with some minor improvements. Save over a hundred bucks and buy a bunch of ammo for the Taurus. Aftermarket parts for this gun, since it is a Beretta military pistol clone, are abundant. You can find everything from magazines to holsters to sights to grips and more. BOTTOM LINE: The Taurus PT92 is a big gun. It’s characteristics are soft recoil, very good accuracy, and dependability. At combat distances (7-21 feet) it was nothing to tear the center out of a five inch target. At longer ranges, the gun easily shoots well enough for effective competitive use, and certainly well enough at any distance for self defense. As to the ability to conceal it, you know, you can conceal anything if you’re determined, but……..you’ll probably want to find something a little smaller and/or lighter for concealed carry. NOTE: I base all handgun reviews on practical use, shooting off-handed from reasonable distances – no further than 25 yards and usually in the 10 – 15 yard range.